Today, Apple released one of the most amazingly advanced apps it’s ever made—but one aimed at a fraction of its users. There’s no metronome, no click track, no count-off; you just start when you’re ready. (There’s even an Auto mode that begins recording as soon as you start playing, saving you the tap on the Record button.) 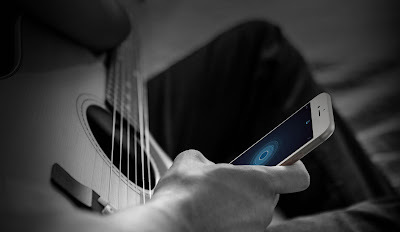 Understand, your instrument is not plugged into the iPhone; it’s recording only from its microphone. But what about the bass? To come up with an automatic bass line, the software has to do something even more impressive: It has to analyze the harmonies of what you played, and determine for itself what the chords are. This is a very difficult job. Software that can understand complex harmonies is every bit as amazing as software that can understand spoken English. Maybe harder. There have been music apps that can transcribe single-line melodies,where only one note at a time is ever sounding (from a flute or a singer, for example). But for software to hear and interpret polyphony—multiple notes played simultaneously (chords), as from a guitar or piano—is astonishingly hard. It’s like asking you to type out the transcript of four overlapping, simultaneous party conversations. If you play something pretty straightforward—a blues progression or a fairly straight-ahead rock ditty, for example—Music Memos nails it. You record, you turn on the virtual bass and drums, and hit Play, and your jaw falls out of its socket. As long as you didn’t stray much from the primary chords in the key, the bass plays along perfectly. The bass player doesn’t always get it right, though, when the harmonies are even slightly more unusual. It simply guesses the wrong notes to play.